Braiseworth has never been big. When the Victorians rebuilt the decaying medieval church, they did so up on the top road. It was closer to the few people that there were. 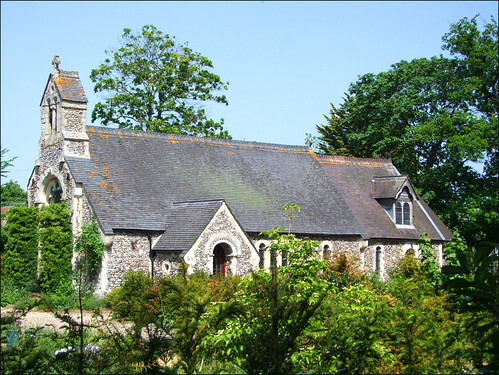 If they had simply tarted up the old building, there is a chance that Braiseworth would still have a parish church; little-used, no doubt, but kept in action under the kind wing of some neighbouring benefice, and still accessible as a touchstone to the past generations. But when the Anglican Diocese set about rationalising its resources in the 1970s, the Victorian St Mary was always going to be one of the first to go. Heart-breakingly, there couldnt be much argument about this; far more controversial was the redundancy and eventual selling off of such gems as Mickfield and Ubbeston. No Redundant Churches Fund wish-list was ever likely to include this one, so it too became a private house, and remains so to this day. Big mistake. For in the 1970s, Victorian churches, and Victorian architects, were not fashionable. They are today, and as it turns out, this church was designed by one of the most fashionable of all, the maverick EB Lamb, most famous in Suffolk for his seriously weird rebuilding of Leiston. Here, his starting point was the Norman remains of the old church, but any inspiration that came from this was transmuted by whatever drugs he was on at the time. Pevsner describes it as 'Lamb in all his perversity', and positively purrs with pleasure. About ten years ago, when I first added this church to the site, I received a very polite letter from the lady who lives in this church, explaining that I really shouldnt have Braiseworth on my site. It was no longer a church, she said, and could be of no interest. In this, she was quite wrong, of course; not only is it a very architecturally significant building, but hundreds of American and Australian family history hunters would clamour to disagree with her. For them, this place is holy ground, as they reconstruct the past, and learn where they came from. In this sense I think that, although it is no longer a church, it is still a spiritual place. Lamb tore down the nave of the old church, reusing the Norman doorways here. It was consecrated in 1857. It must have been a fine sight, a new church for a new age of optimism. They could not have imagined that, in a little more than a century, it would all be over. Today, the setting is thoroughly domestic, hedge-surrounded and gardened.The churchyard was never used for burials, which continued at the site of the old church, but when I came this way ten years ago I saw that still remaining on private land was the Braiseworth war memorial. Is it still there today, I wonder? Now, the hedges are too high to see. The parish has never been big enough for it to have many names on it. But in the years after 1918, there were families in this parish who saw it as a focus for their grief, and perhaps still do today.